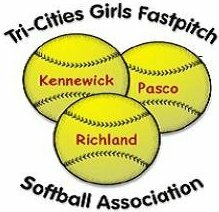 The Tri-Cities Girls Fastpitch Softball Association (TCGFSA) is a not-for-profit organization providing opportunities for young ladies ages 6 - 18 to play recreational and competitive Fastpitch Softball in the greater Tri-City area of Washington state. TCGFSA is open to girls from ages 6-18 living or attending school in or near the Tri-Cities area. Note that a player MUST be 6 by December 31, 2018 in order to be old enough to play. Can I join even if I have never played softball? Absolutely! We encourage all skill levels to join. Our leagues are built around girls playing with friends and having fun as well as learning the game and building skills. How long is the season? The TCGFSA recreational Spring softball season runs from April through June/July. There may be a Fall softball season depending on interest, and would run between early September and mid-October. 10U 2008 - 2009 Instruction on fundamentals of hitting, base-running, and defense. Combination of Player and Coach pitch. Games are scored and reported with a limit of 3 runs per team per inning, with modified game rules (see By-Laws for more information). There is a post-season tournament with seeding determined by win-loss record. 12U 2006 - 2007 Emphasis on fundamentals and more advanced defensive strategies and skills. Run limit is now 5 runs per team per inning, with regulation ASA rules. Win/loss records are kept and used to determine seeding for the post-season tournament.